In water culture systems the plants are placed such that their leaves are bathed in the nutrient solution within the holding tank. In a floating ( sometimes called a ‘Raceway system’) like the one opposite the nutrient holding tank is actually the growing bed. The plants themselves are placed into holes on floating styrofoam boards with their roots dangling into the nutrient solution. The solution itself rather than being pumped around as in the other systems, Is oxygenated and moved around the plant roots by an aquarium type air pump attached to a perforated tube at the bottom of the holding tank, Which continuously blows air bubbles into the nutrient solution. Plants which seem to enjoy living in this system are leafy plants such as Luttuce, Spinach, Chard etc. Unlike the other systems here the pump must be run continously to oxygenate the nutrients. I am regularly using this system each year now successfully along side my main hydroponics systems to grow batches of lettuces. To see what my water culture system looks like have a look at the Greenhouse No 2 page. 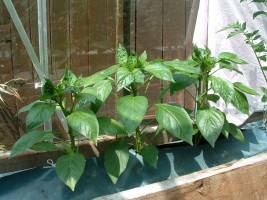 This entry was posted in Hydroponics, Methods and tagged fruit, greenhouse, growing, hydroponics, methods, plants, seeds, vegetables, water culture by Paul_E. Bookmark the permalink.